After a two week spell of unseasonably cold, wet weather, hailstones even, spring has finally sprung. I arise to beautiful, blue skies and bright sunshine. 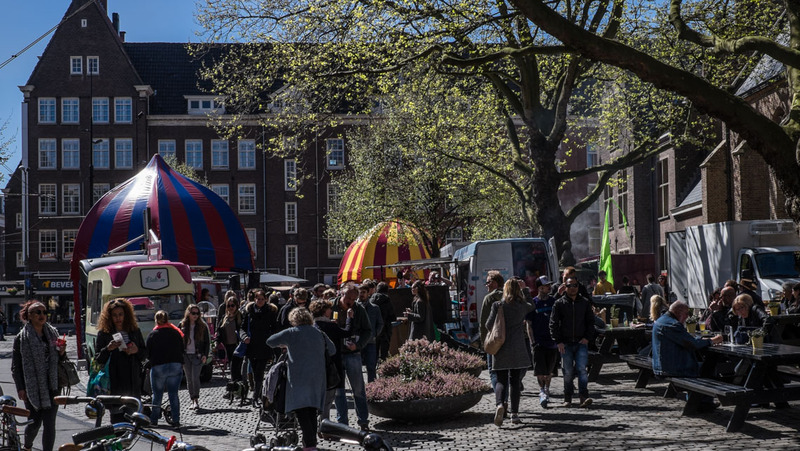 It’s Sunday, the 1st of May, during late spring/summer — so it’s my lucky day, as the Swan Market is coming to The Hague today. Guess where I am headed?? There are several unique things about this market: I love that it moves from one city to another, never in the same place twice, and in each place there is a different vibe. The market supports start-up entrepreneurs, who are trying to reach a wider audience with their products. If you have a unique idea, this may be the place to showcase it. The food section is separate, all the food outlets are converted from old vintage vehicles, but all fully functional. I breezed my way through the leafy streets, and woods, on my way to The Hague in search of some Sunday chill time. A sure fire way to banish those winter blues, as I immersed myself in a world of vintage, handmade crafts, food, and music. 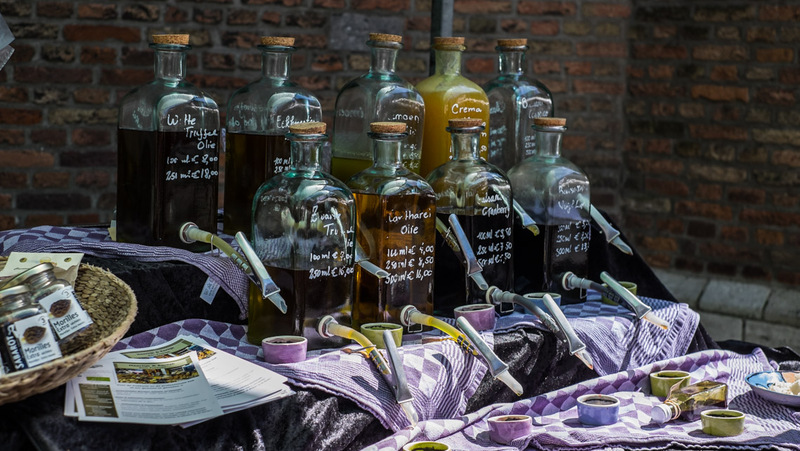 This market, with it’s original feel, set against the backdrop of the stunning Grote Kerk, certainly did just that for me, I left several hours later, feeling elated, chilled, and lighter, especially in the purse area! A very unhurried, relaxed, Sunday afternoon indeed. Don’t expect every edition of Swan Market to be the same, the vendors vary from location to location, but to me, that gives it variety and intrigue, encouraging you to visit more than one location. After all, what’s not to like about sitting around in the sunshine, sipping on a coffee, listening to a local artist, providing entertainment to the Sunday afternoon crowds. Or browsing the handmade stalls, bagging a few original pieces of jewelry, vintage threads or furniture whilst sampling the atmosphere, and food, of this bohemian style market. The food stands should be part of your reason for visiting. Ranging from street food, cupcakes, dried fruit, superfoods, crepes, ice cream, regional bbq food. Last Sunday’s open air bbq was Buenos Aries street food, the queue was the longest in the entire market. All food and drink stands are created using converted old vehicles. This edition, an old German fire engine converted into a wok/stir fry kitchen. Kettlebinkie, a converted old VW with the rear converted into a fully working coffee bar, and the coffee was some of the best I have tasted. 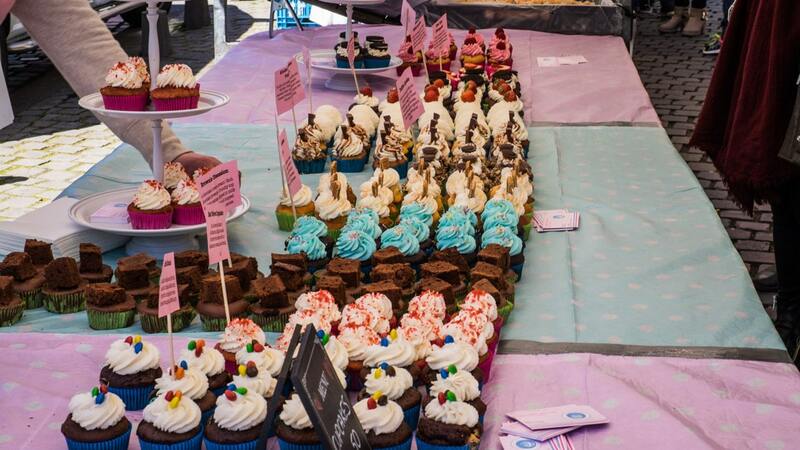 Other food outlets were Asian Street food selling Thai and Indian curries, Puzzles Unexpected Power Food, and Cupcake House — the cupcakes looked almost too good to eat! Also there was Creperie La Monde, Meijes met Ijsjes (girls with ice-cream), and Slagerij (meaning: Butcher), selling smoked meat sandwiches. The meat is smoked on site in a handmade smoker and the waft of slow burning charcoal emanating from the food section will certainly give you an appetite, if you didn’t already arrive with one. So enough eating and drinking, for now, let’s head to the craft side of the market. Hand made goodies await you here from jewelry, greeting cards and postcards, wooden framed sunglasses, phone covers, and vintage clothing/furniture to handmade soap, posters, and dried fruit (an array such as I have never seen before). Heerlijk and Eerlijk (loosely translated to tasty and honest) a delicatessen with a huge array of saucisson, flavoured oils, and truffles also has the bonus of super friendly staff. Fudgeworld, homemade British fudge…Oh wait, that’s more food!